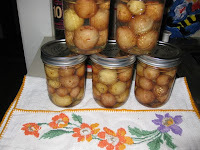 The Canning Doctor: "OK, Now You've Gone Too Far"
This is what my husband said when confronted with my next canning project: potatoes. Really! The farm share this week was full of tiny little potatoes, so I got it in my head that I could can them whole. I didn't want to peel them, and I hope that isn't a fatal flaw or anything. 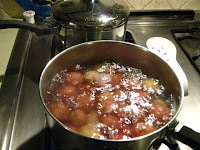 But I did scrub them, boil them, and the processed them a little longer than recommended just in case. This was the first time that I got the heat adjusted for the pressure canner right away and didn't have to fiddle with it for 10 minutes, which is good which means the pressure never dipped during the processing time. I ended up with 5 pints of little red and gold potatoes. Perfect for a quick side dish! I canned potatoes last year and they were amazing. Convenient AND delicious! They weren't whole, but I would go kick your husband in the shin and tell him he can't have any of your delicious potatoes. So THERE!